Mortal Kombat: Deadly Alliance, originally known as Mortal Kombat V: Vengeance or simply Mortal Kombat 5, is a fighting game developed and published by Midway for the Xbox, PlayStation 2, Nintendo GameCube, and Game Boy Advance. It is chronologically the fifth in the Mortal Kombat series. The game focuses on the alliance between sorcerers Quan Chi and Shang Tsung and their schemes to revive an ancient army and control Outworld. 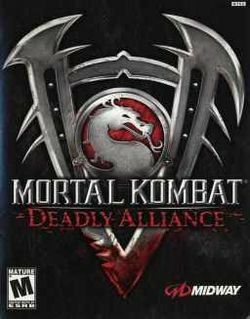 Deadly Alliance was the first all-new Mortal Kombat fighting game produced exclusively for home consoles, with no preceding arcade release. The game's tagline was "A Fight So Brutal - So Evil - So Deadly". Like all of the Mortal Kombat games, Deadly Alliance focuses heavily on its fighting modes. The gameplay is regarded as a full "reboot" of the gameplay style of the franchise. It is credited with reviving the Mortal Kombat series. Different from its predecessors, each character now possesses three individual fighting styles consisting of two martial arts and one weapon (excepting Blaze and Mokap, who received three martial arts and no weapon) which players can switch between with the push of a button. In previous games, aside from "dial-a-combos" all the characters fought virtually identically, with only special moves to differentiate them. The number of special moves per character (usable in any fighting style) has also been reduced, varying only from two to four for most, thus forcing the player to make use of the improved fighting system. Running, as well as the running meter, have been dropped. However, while still limited to only moving into the background and foreground, movement in the third dimension is much easier and can be used continuously (in Mortal Kombat 4, one sidestep could be performed at a rate of about one a second). To prevent fighters from leaving the arena, invisible "energy walls" appear when a fighter is knocked against the edge. Characters models are now more realistic. Flesh will move or jiggle on a character as he or she moves around. Environmental interaction is present, but infrequent. Several levels include obstacles - such as pillars or statues - that can be shattered to damage an opponent standing behind one. There is just one Fatality per character, while the previous games included many ways to finish the opponent. It is also the only Mortal Kombat game to date that does not includes Stage Fatalities, although the Acid Bath level still possesses special acid-vomiting statues called Acid Buddhas that does damage directly to fighters that stay too close. Deadly Alliance also introduces a "Konquest" mode, which expands on the storyline and acts as a tutorial for each character. Konquest mode consists of a series of missions to complete with each of the characters. In between each sequence, a video of a monk moving between various locations on the path of Konquest is shown, but this has no actual bearing on the gameplay itself other than to simulate the sense of a journey. After completing eight initial kombat tasks with Sub-Zero, the player is instructed to complete a specific set of tasks with each character, which vary from pulling off difficult combos to defeating opponents. Each series comes with text instructions that include a basic storyline that delves further into each character's backgrounds and motives. The characters Blaze and Mokap can only be unlocked by completing all stages of Konquest. Upon completing each mission (of a starting difficulty for each character that increases per mission), the player is rewarded with a number of koins that can be utilized to open Koffins in the Krypt and unlock secrets in the game. The game has a "Krypt", where the player can buy extras with koins earned in regular play and in Konquest mode. The Krypt consisted of 676 Koffins arranged in a square format with each designated alphabetically by a two-letter designation (AA - ZZ). The Koffins were filled with a vast number of secrets and unlockables available only through that game. Each Koffin had a different designated price, listed in a number (anywhere from 1 up to the thousands) and color (Gold, Ruby, Sapphire, Jade, Onyx, and Platinum) of koins that were needed to purchase the opening of the Koffin. The Krypt included unlockable characters, arenas, and alternative costumes. Also included amongst the Koffins were various videos, images, concept sketches, and the entire Mortal Kombat Collector's Edition comic book. Some Koffins contained koins that could be used towards other Koffins, others contained hints as to where highly sought after items were located, and others were even empty. One of the unlockable items from the Krypt is a CGI bag of adult nappies (complete with advertisement text). This is nod to a long-standing joke/urban legend that gamers will wear nappies to keep from having to take restroom breaks at crucial times. The Wilhelm scream can also be heard in the Krypt. Test Your Might, the original minigame of the Mortal Kombat series, returns for the first time since the original game, and a parody, Test Your Sight, is also included. This involved the character standing above a set of cups, and the game would show the player which cup had the Mortal Kombat logo icon in. The cups would begin to move in a random order, and by the end one has to select the cup which the icon was in. As the player progresses through the minigame, the number of cups would increase, as would the speed in which the cups would move. At higher levels, the camera would even move in order to make it more difficult for the player to keep track of the movement of the icon. This game would also be rewarded with Koins. In Deadly Alliance, the player receives information concerning the backstories of the characters and their relationships with one another mainly during Konquest mode, but also in way of biographies that can be obtained in the Krypt. The game takes place in a fantasy setting, with most of the game's events occurring on the fictional realms of the Mortal Kombat series. The story begins in the Netherealm (although this is not a playable level), and later switches to Outworld, Edenia and eventually Earthrealm. To fully understand the plot of Deadly Alliance, the player must not only beat Konquest mode but Arcade mode as well. As usual, beating Arcade mode unlocks endings for each character, but only a few endings or a part of them are considered canon to the Mortal Kombat storyline. Some endings even contradict one another. What really happened to the characters was only revealed on the sequel Mortal Kombat: Deception, making Deadly Alliance the first game in the series to have a canonical ending that involves the heroes losing and the villains emerging victorious. The protagonist of the game is Kung Lao (Replacing Liu Kang's role due to his death. ), the main antagonists are, as the title implies, the Deadly Alliance formed by sorcerers Quan Chi and Shang Tsung, and both act as the final bosses (depending on the storyline of that particular character it varies whether you'll have to fight Shang Tsung or Quan Chi, for example say you're playing with Kung Lao, then his boss would be Shang Tsung because he was responsible for killing Liu Kang in his storyline, in which he's wanting to avenge the death of). Some of the more popular characters of the Mortal Kombat series returned in this title. Included are Hollywood movie star Johnny Cage, the Princess Kitana, the monk Kung Lao, the Lin Kuei Grandmaster Sub-Zero, the Black Dragon mercenary Kano, the Zaterran warrior Reptile, the Ninja specter Scorpion and Special Forces Major Jax Briggs, Lieutenant Sonya Blade and the cyborg Cyrax. New characters include the blind warrior Kenshi, the drunken-master Bo' Rai Cho, the Outworld warrior Li Mei, the vampire Nitara, the Lin Kuei apprentice Frost, Red Dragon agents Mavado and Hsu Hao, and the Netherealm Onis Drahmin and Moloch, who also acts as the sub boss of the game. The two secret characters are Mokap, who is said to have done motion capture work on Johnny Cage's films and is actually a tribute to Carlos Pesina, and the fire elemental Blaze, which was originally a background character on The Pit stage from Mortal Kombat II. According to art director, Steve Beran, Frost was one of the first characters designed for Mortal Kombat: Deadly Alliance. Deadly Alliance is notable for being the only game in the series that does not feature Liu Kang as a playable character, as he and Shao Kahn only appear on the introduction video. Also mentioned in Konquest are the deaths of Goro, Kabal, Motaro and Sheeva, but they would later appear on sequels. The Dragon King mentioned in the game would later appear as Onaga in the sequel Mortal Kombat: Deception. Deadly Alliance is also the last game to feature both Scorpion and Sub-Zero in their unmasked forms and the first and only game where Kung Lao doesn't have his trademark hat on his main costume but from behind his back. Shang Tsung, Quan Chi and Scorpion were included in both versions. Frost, Jax, Sub-Zero, Kano, Kung Lao, Kenshi, Kitana, Li Mei, and Sonya are included only in the first Deadly Alliance port. Bo' Rai Cho, Cyrax, Drahmin, Hsu Hao, Johnny Cage, Mavado, Nitara, Raiden and Reptile are included only in Tournament Edition. Blaze, Mokap and Moloch are excluded in both versions. Tournament Edition builds on the story of Deadly Alliance by including three extra characters that were not in the original versions. These were Sektor, Noob Saibot and Sareena. Sektor and Noob Saibot are palette-swaps of Cyrax and Scorpion respectively, while Sareena returns from the action-adventure game Mortal Kombat Mythologies: Sub-Zero. Tournament Edition is the only Mortal Kombat that does not feature Sub-Zero in any form. Noob Saibot, the original Sub-Zero, is playable, although his identity was not revealed to players until Mortal Kombat: Deception. This page was last edited on 3 January 2015, at 22:35.